If you’ve never tried cream cheese in your mashed potatoes, then you are really missing out. However, while potatoes are still close to my heart, they are no where near a low carb diet. But my friend cauliflower is always there to fill the empty void left by the removal of potatoes from my diet, and in this case, it does a great job filling in for mashed potatoes. Break the cauliflower into florets and cook, covered, in the microwave for about 12 minutes, or until it’s very soft. I usually do this before starting to make whatever else I’m making for dinner, and then let it continue to steam in the microwave while everything else is cooking. I used to add a little water to steam it, but now I find that if I just let the liquids in the vegetable create the steam, the mashed cauliflower is thicker, more like mashed potatoes. 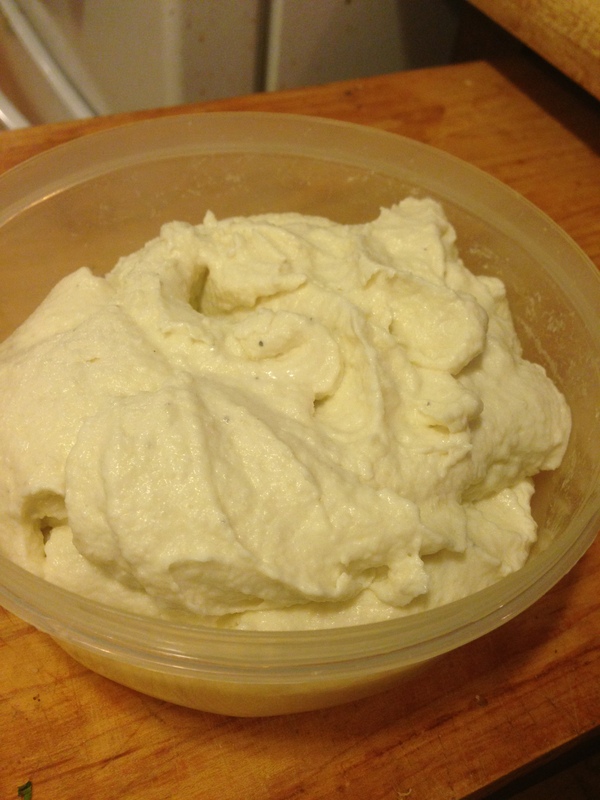 Drain all the liquid from the cauliflower, and then put it in a medium sized bowl with the cream cheese. 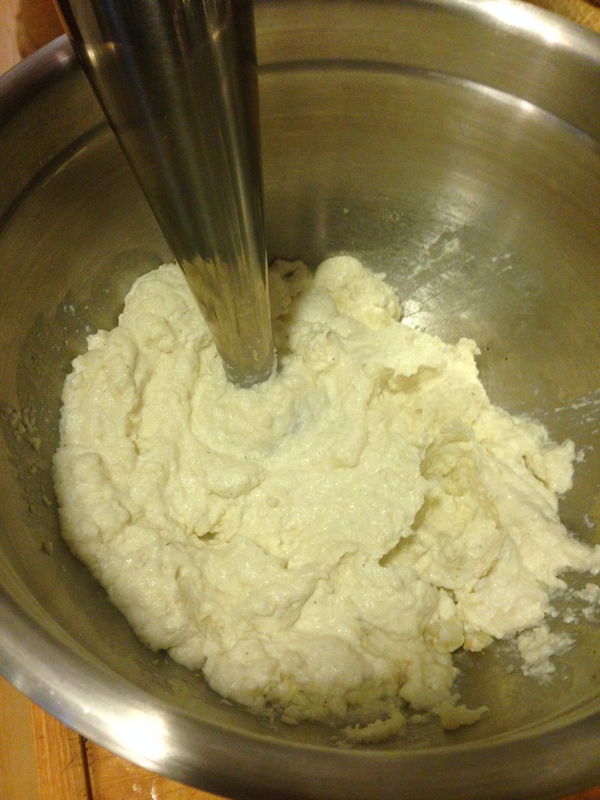 Puree the cauliflower and cream cheese with a stick blender until they are very smooth. If you haven’t steamed the cauliflower until it is very soft, you’ll end up with a grainy and somewhat unpleasant end product, so make sure it’s as soft as you’d want potatoes to be before mashing. If it doesn’t seem creamy enough, add a few pats of butter and blend it in. Season with salt, pepper, and garlic powder to taste. Just a few shakes of garlic powder will be enough to make the slight sulfur taste and odor of cooked cauliflower much milder. There’s probably a complicated chemical reason why this works, but all I know is that a little garlic noticeably cuts the cruciferousness. It reheats really well, so if you make this first, just put it in the microwave for a minute or two and it will be ready to serve. It is good with gravy or just plain. I like to eat it with saucy dishes, like stewed meatballs with tomatoes and green beans. However you use it, it works well for anything you’d use mashed potatoes for, like shepherd’s pie.